This goal trainer has three holes each of which is a different size for striking practice. 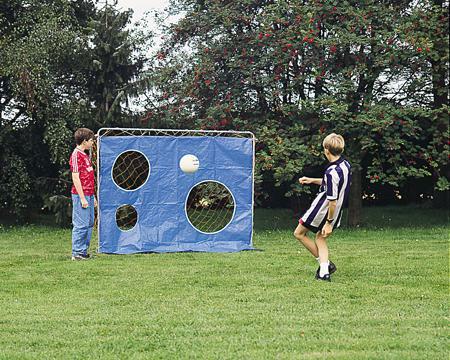 Included is a tough blue plastic sheet that ties onto the super goal frame (sold separately) allowing for practice. You will find similar products at football festivals or fêtes because it’s a great game that the whole family can enjoy. See who is the best striker by trying to get the ball through the targets on the plastic sheet. 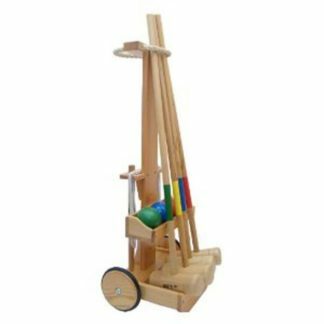 Strong, durable and easy to set up, this product can be used within minutes of opening and will provide endless hours of fun (and frustration)! Do you have a child who is a keen striker? They can practice at home in the garden thanks to the TP Holey Goal Trainer. The aim of this product is to help your child with his or her shooting skills by trying to aim the ball at the holes in the football goal.